In December 2017, we completed work to remove a Mark 1 ‘Inglis Bridge’ from the side of the M180 near Scunthorpe, believed to be the only one of its kind in the world. The ‘Inglis Bridge’ was designed by Charles Inglis during World War 1 and came into active service in 1916. The bridge was the first multi-use, component built bridging system taken into service by the Royal Engineers and was used extensively throughout the two World Wars. Capable of swift assembly from basic footbridges to carrying heavy military re-supply traffic, the bridging system became the forerunner of the Bailey Bridge and other equipment taken into use by military and civil engineers throughout the world. We undertook substantial preparatory works before the lift including vegetation clearance, access works, and installation of a temporary frame and bracing on the historic bridge prior to the planned lift. We used 200t of imported stone for the haul road and crane pad. We then used a 400t crane on the M180 for the main lift and a smaller 35t crane in the field for lifting steelwork to strengthen the structure before the lift. 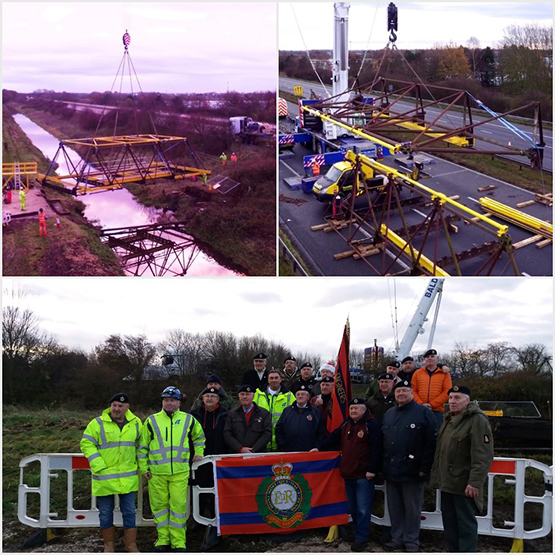 On the day of the lift, we welcomed 20 retired Royal Engineers to site who supplied bacon and sausage sandwiches for the works team and watched with interest the operation to remove the bridge. This important military artefact was transferred to Royal Engineer workshops and will undergo renovation preparatory to final display at the Corps of Royal Engineers Museum in Gillingham.